Emperor Sakuramachi (桜町天皇, Sakuramachi-tennō, 8 February 1720 – 28 May 1750) was the 115th emperor of Japan, according to the traditional order of succession. Sakuramachi's reign spanned the years from 1735 through 1747. 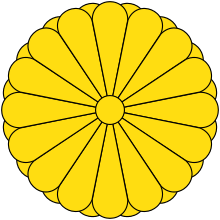 Before Nakamikado's ascension to the Chrysanthemum Throne, his personal name (imina) was Akihito (昭仁); and his pre-accession title was Waka-no-miya (若宮). He was the firstborn son of Emperor Nakamikado. He was said to be the reincarnation of Prince Shōtoku. With the support of Tokugawa Yoshimune, he worked for the restoration of Imperial rites, bringing back the Daijōsai (大嘗祭, the first ceremonial rice-offering by a newly enthroned emperor) and the Shinjōsai (新嘗祭, a ceremonial rice-offering by the emperor) among others, and concentrated on restoring other courtesies. 17 July. 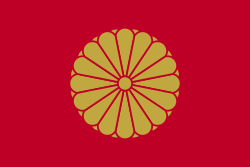 1728: Akihito-shinnō was named Crown Prince. 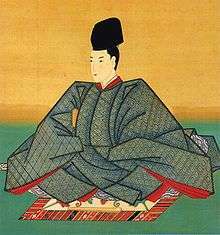 13 April 1735: Prince Akihito became emperor upon the abdication of his father. 1736 (Genbun 1): The shogunate published an edict declaring that henceforth, the sole, authorized coinage in the empire would be those copper coins which were marked on the obverse with the character 文, pronounced bun in Japanese, the same character the era name Genbun. 1738 (Genbun 3): Esoteric Shinto rituals Daijō-e (大嘗會) were performed by the emperor. 1739 (Genbun 4): Some foundry workers in Edo are commanded to create iron coins for use across the empire. 1739 (Genbun 4): Hosokawa Etchū-no-kami of Higo was killed in Edo castle by Itakura Katsukane, who was ordered to commit seppuku as just punishment; however, Shogun Yoshimune personally intervened to mitigate the adverse consequences for the killer's fudai family. 8 August 1740 (Genbun 5, 16th day of the 7th month): Great floods in Heian-kyō. Sanjo Bridge was washed away. 11 January 1741 (Genbun 5, 24th day of the 11th month): The esoteric Niiname-matsuri ceremonies were performed. This specific ceremony had otherwise been held in abeyance for the previous 280 years. 12 January 1741 (Genbun 5, 25th day of the 11th month): The esoteric Toyonoakari-no-sechiye ceremonies were performed. 1742 (Kanpō 2, 8th month): Persistent heavy rains create floods throughout the country, with noteworthy devastation in Musashi Province, Kōzuke Province, Shimotsuke Province, and Shinano Province. In Heian-kyō, the Sanjo Bridge is washed away in this destructive storm cycle. 1743 (Kanpō 3, 11th month): A comet was sighted in the night sky; and this comet was likely comet C/1743 C1 (De-Cheseaux). 1744 (Enkyō 1): Great comet was visible in sky for many months; this comet was very likely C/1743 X1 (De Cheseaux). 1745 (Enkyō 2): Tokugawa Ieshige became shogun of the Edo bakufu. 1745 (Enkyō 2): First establishment of a market fair in the capital was to be found at Hirano Shrine, in the Ōmi Province. 1745 (Enkyō 3, 2nd month): A great fire sweeps through Edo. 9 June 1747: The emperor abdicated. 28 May 1750: Sakuramachi died at the age of 30. Sakuramachi's kami is enshrined in an Imperial mausoleum (misasagi), Tsuki no wa no misasagi, at Sennyū-ji in Higashiyama-ku, Kyoto. Sakuramachi's immediate Imperial predecessors since Emperor Go-Mizunoo – Meishō, Go-Kōmyō, Go-Sai, Reigen, Higashiyama and Nakamikado, are also enshrined along with his immediate Imperial successors, including Momozono, Go-Sakuramachi and Go-Momozono. The years of Sakuramachi's reign are more specifically identified by more than one era name or nengō. ↑ Ponsonby-Fane, Richard. (1959). The Imperial House of Japan, p. 119. ↑ Titsingh, Isaac. (1834). Annales des empereurs du japon, pp. 417–418. ↑ Ponsonby-Fane, Imperial House, p. 10; Titsingh, p. 417. ↑ Meyer, Eva-Maria. (1999). Japans Kaiserhof in der Edo-Zeit, pp. 47–48. 1 2 3 Meyer, p. 47. 1 2 3 4 5 6 7 8 9 Titsingh, p. 418. ↑ Screech, Timon. (2006). Secret Memoirs of the Shoguns, pp. 117–121. 1 2 3 4 Ponsonby-Fane, Richard. (1956). Kyoto: the Old Capital of Japan, 794–1869, p. 321.